For the fiscal year ended September 30, 2014, the United States Mint recorded revenue of $3.10 billion, yielding seigniorage and net income of $367.9 million. These results represent a decline of 28.4% in revenue, but an increase of 25.8% in seigniorage and net income. The United States Mint is the world’s largest coin manufacturer, operating six facilities and employing approximately 1,600 employees. The facilities at Philadelphia and Denver produce coins of all denominations for circulation, with all sculpting and engraving of coin and medal designs performed at Philadelphia. The facilities at San Francisco and West Point handle the production of numismatic products and bullion coins. All four facilities produce commemorative coins in accordance with authorizing legislation. The United States Bullion Depository at Fort Knox stores and safeguards gold bullion reserves. Administrative and oversight functions are performed at the headquarters located in Washington, D.C. The United States Mint generates revenue through the sale of circulating coins to Federal Reserve Banks, bullion coins to a network of authorized purchasers, and numismatic products to the general public. During the 2014 fiscal year, the overall decline in revenue was driven by a decrease in both sales prices and sales volumes for bullion coins. This was partially offset by the continued rise in production volumes for circulating coins, while numismatic product revenue remained relatively flat. Since the bullion program operates at a nominal net margin, the impact to overall net income was limited and more than offset by the increased contribution from the higher margin circulating coin segment. The contribution to net income from the numismatic segment experienced a decline for the fiscal year due to decreased earnings from silver products and losses generated from from annual recurring set offerings. 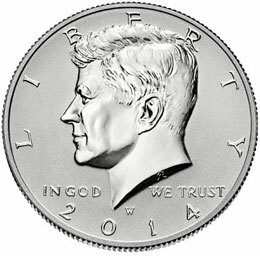 During the 2014 fiscal year, the United States Mint transferred $272 million to the Treasury General Fund, consisting of a non-budget transfer of $250 million of seigniorage and a budget transfer of $22 million from numismatic program results. The transfer amount is down compared to the $392 million transferred during the 2013 fiscal year. Who said the US can never default on a loan because it can just print more money? ?